The rain and homework have slowed photo taking recently. Guess it’s good to give the camera a rest once in a while, since there are only 150,000 or so actuations for this camera model! Here’s two of those longer actuations, both in black and white with the bottom one treated with a little split-toning for the heck of it. I was hoping to post much earlier than this, but grad school and moving to California decided against it. 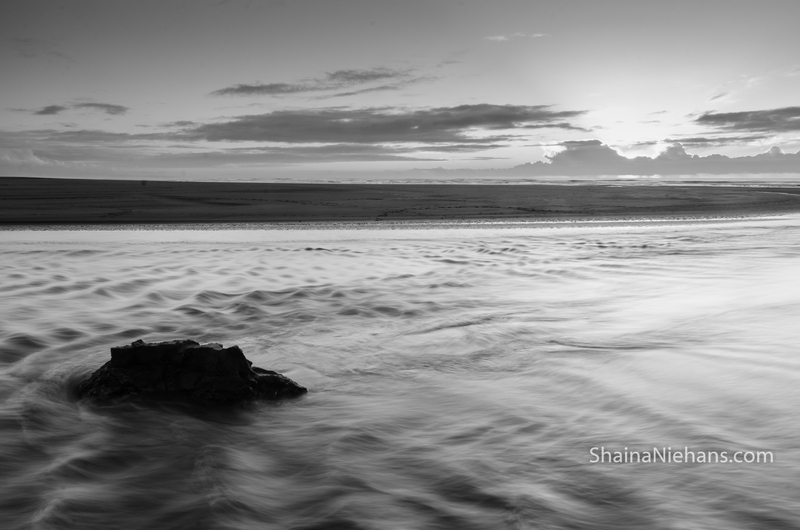 This post is heavily focused on the ocean, both Atlantic and Pacific. 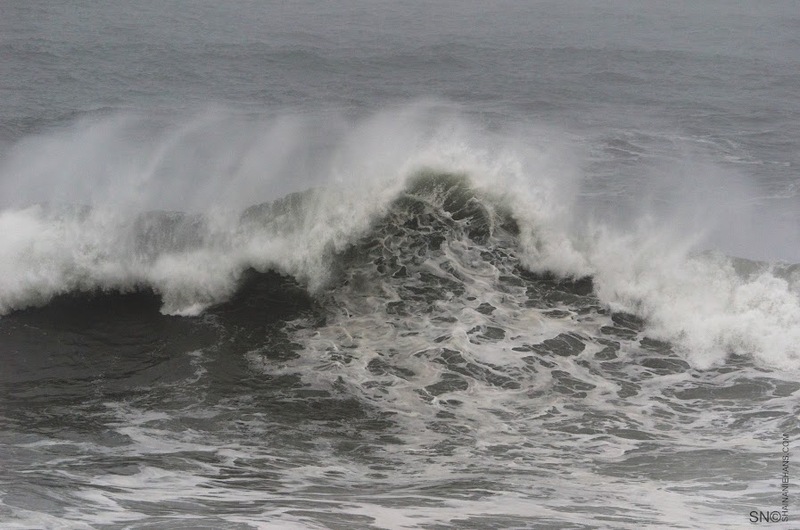 Of course the differences between the two are easily noted, and I was expecting that, but seeing an angry Pacific wave crash was far more fierce than anything I had seen on the Atlantic–even on heavy surf days. 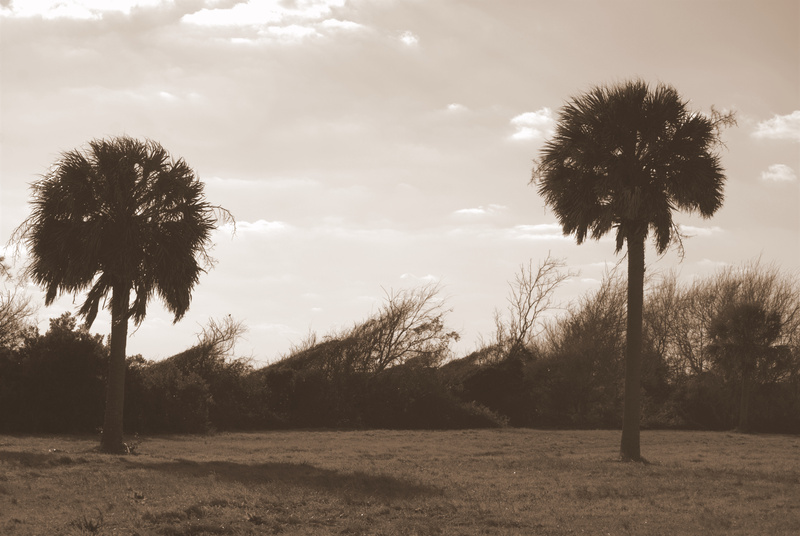 Botany Bay Plantation, a set on Flickr. 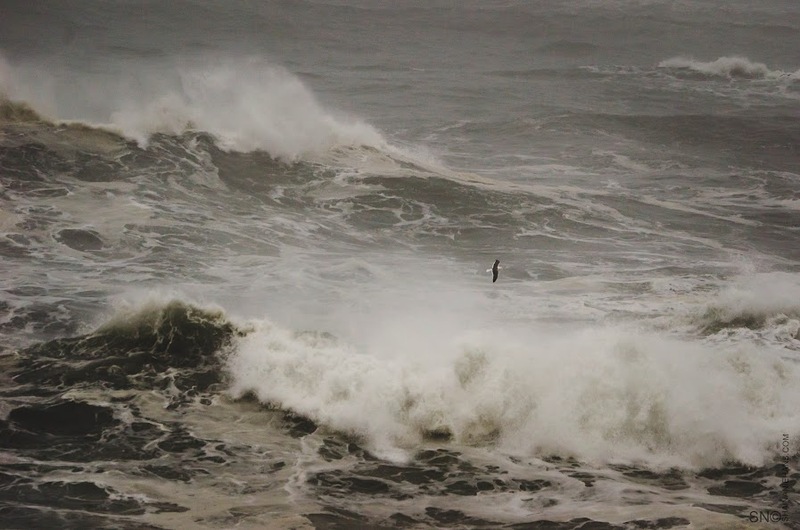 Though the Atlantic is more ‘tame’ than the Pacific, the tree boneyard is a testimony to the power of water, no matter the temperament. Botany Bay Plantation, a former working plantation, is currently managed for game and wildlife. While the beach is accessible, there is a guard standing watch to ensure that no one takes any shells, since shelling is prohibited. The difference between this beach and the shelled beaches is astounding…you can nearly visibly see the difference in the sand’s composition. Beach visitors are surprisingly thorough at removing nearly all sizable pieces of shell on heavily visited beaches! On to the Pacific! Specifically, Samoa, to the Lost Coast, to Trinidad, and near Orick, California. I must say, I could have stopped in Utah or Nevada–such beautiful and stark scenery, but the views here are outstanding in other, and greener, ways! We’ve been lucky with the weather so far, but this area *isn’t* where the phrase “sunny California” originated. In fact, the ‘Redwood Curtain’ thrives on all the moisture that falls here, either in the form of rain or dense fog. 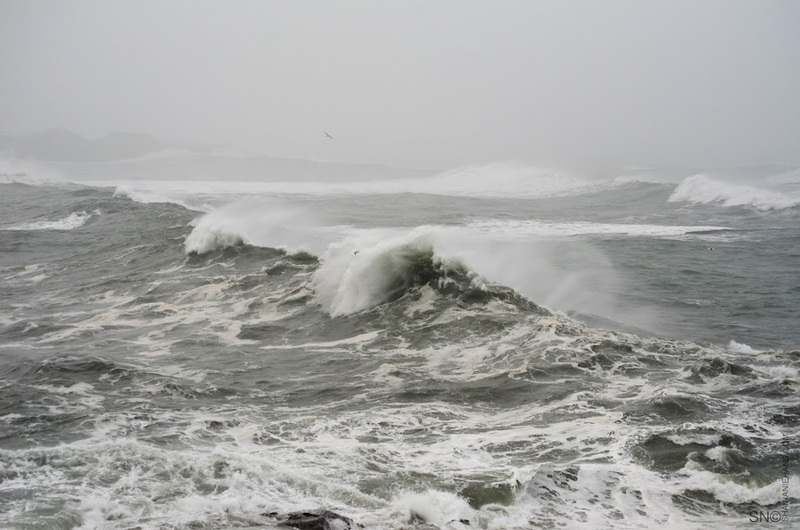 It was shocking to us to see waves rolling through one side of the harbor entrance that are large enough to trouble decent-sized boats. 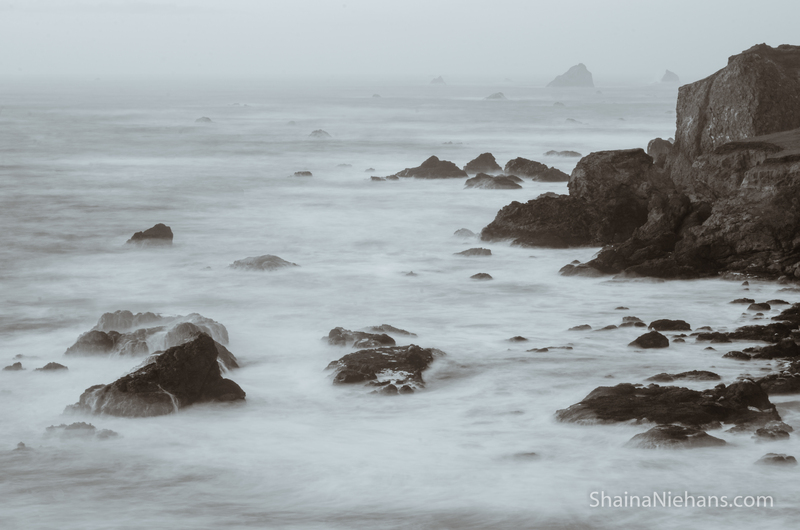 We’re still very shy when it comes to the Pacific, not wanting to meet a sneaker wave, but we’ve enjoyed the tide pools, sea stacks, and harbor seals. 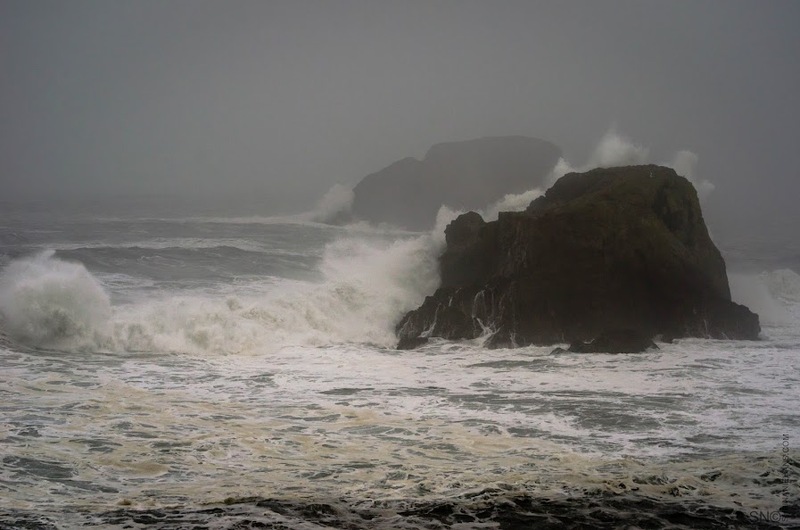 It still takes my breath away when a wave crashes up a tall sea stack! An amazing feat seems to be the survival of the tide pool animals. The tides’ schedule here deviates from the Atlantic’s. There is one large and one small high tide, with corresponding low tides, so some animals won’t see water for 18 hours or so. That’s a long time to hold your breath! Of course, future posts will cover the tide pools and redwoods and banana slugs and I am overly eager to explore more, but this summer I am taking a brief detour to New Hampshire to work a park there, so the scenery of this blog will change yet again…it feels like the middle of everywhere! 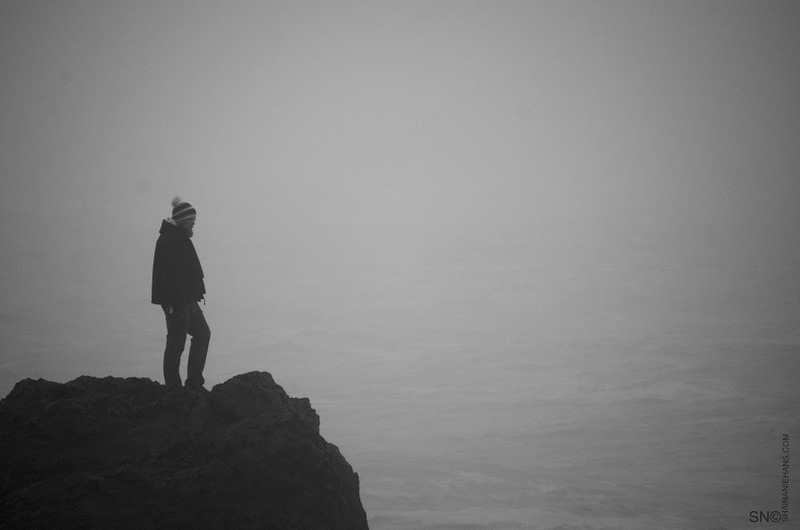 Pacific, a set on Flickr. ..to recovery! I am finally feeling close to 100% thanks to modern medicine and I am nearly caught up on homework. Medical and mental statuses aside, we quickly jaunted up to Southport, NC to visit with my grandparents [before I fell ill]. 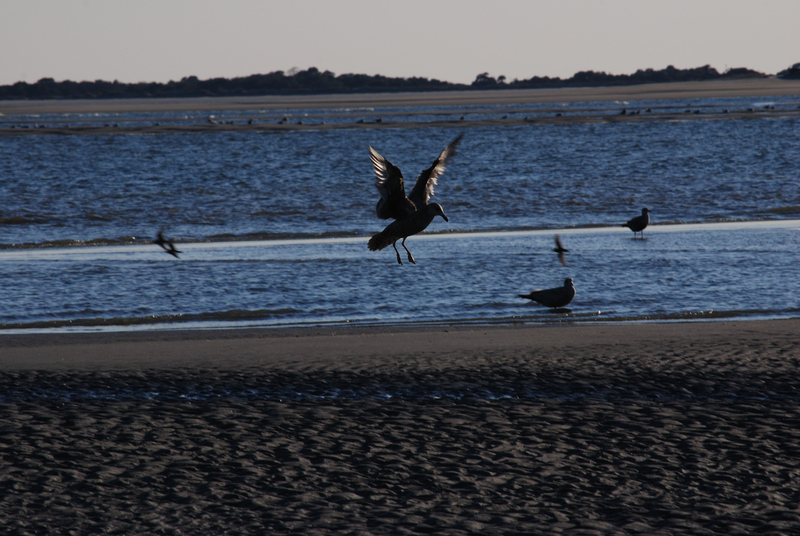 Though it was ‘bitterly’ cold, we ran on to and off of a couple beaches and took a ferry ride over to the North Carolina Aquarium at Fort Fisher. This Ring-billed Gull accompanied us on the short ferry ride, but I don’t think he got as much out of it as we did! This blog has been hit many times by people looking for answers about the creatures they are sharing the beach with. I thought I should put together something more concise than my random posts to help out these curious folks, so here it is! 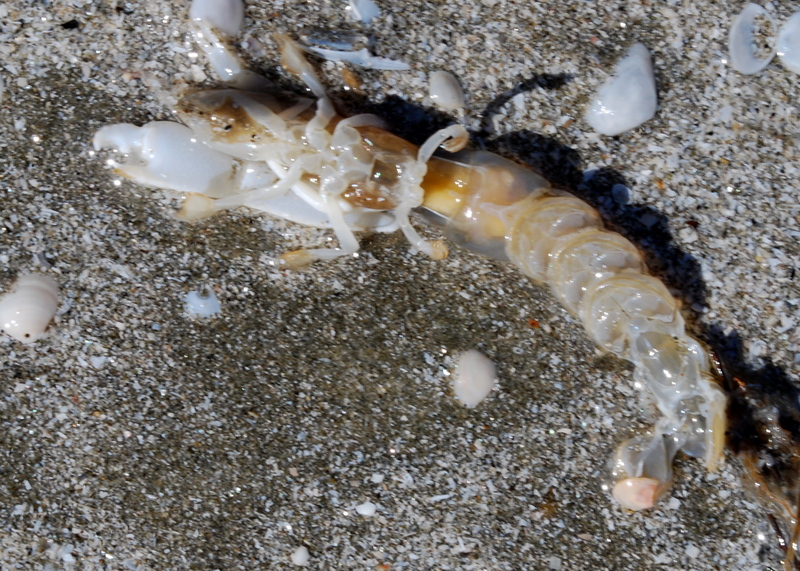 Below you will find descriptions about common animals found on beaches near Charleston, SC. 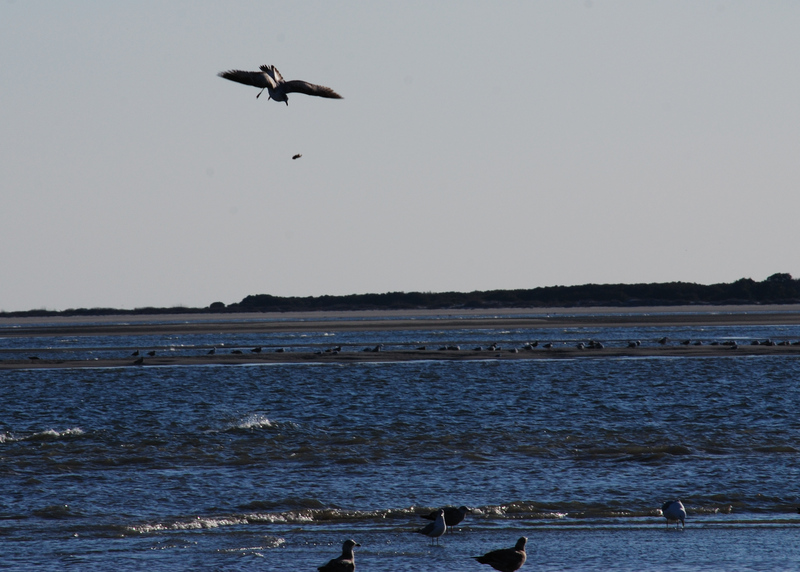 Probably the most ubiquitous and well-known animal at the beach is the seagull. 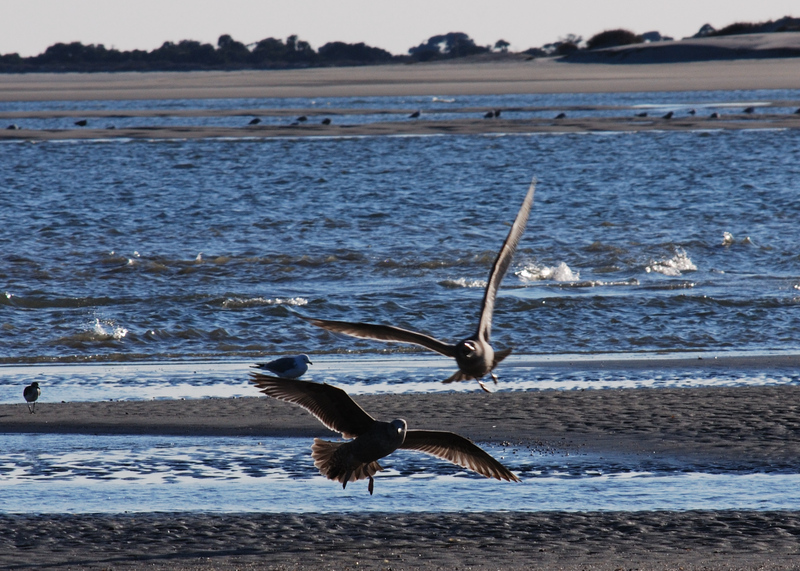 In South Carolina there are 5 species of gulls, with the Laughing and Herring Gulls as the most common during the summer months. They are opportunistic feeders and will scavenge anything they find on the beach, including dead fish and washed up jellyfish. Some species have figured out how to open shells by dropping them on pavement or hard sand. 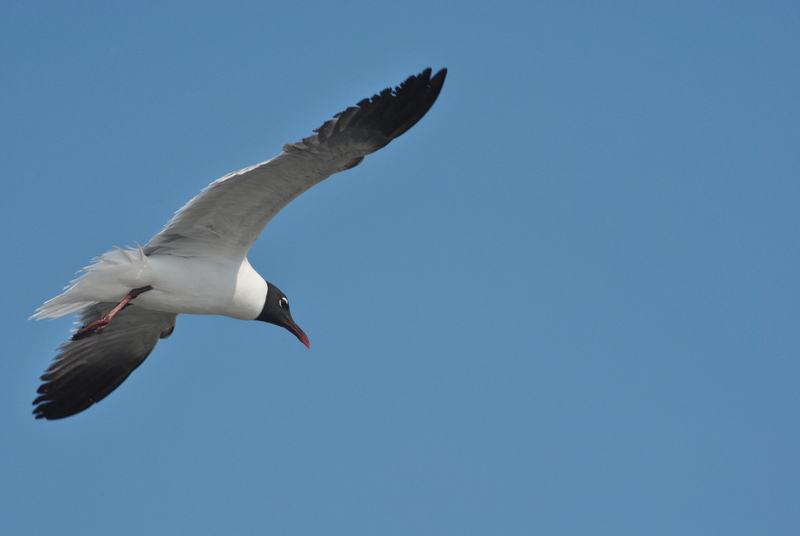 The Laughing Gull, so named because of its comical call, has learned that a human with sandwich bags, coolers, or cracker boxes will probably drop crumbs, and therefore it is nearly impossible to eat on the beach without a squadron of screaming bird beaks announcing your culinary activities. 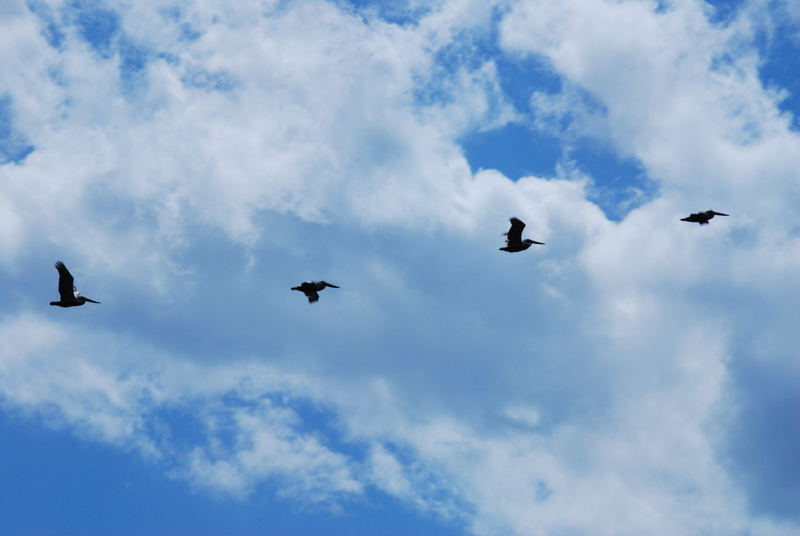 Another prominent bird is the Brown Pelican. 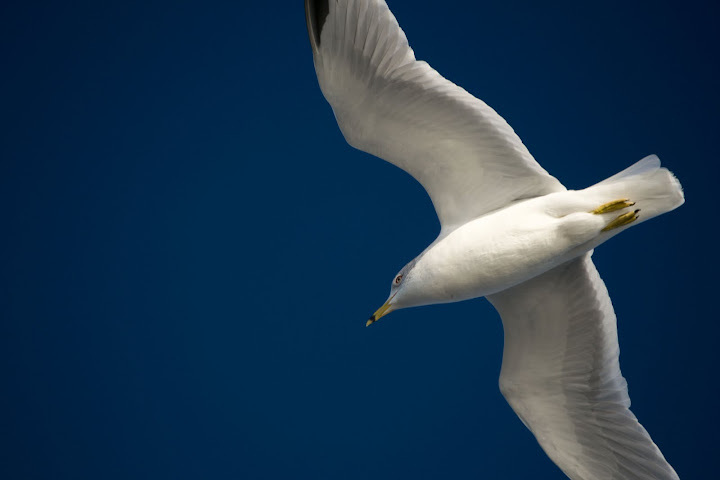 Although you won’t often see it next to your beach towel, this bird is often seen diving into water head first for a fish, gliding just above the waves, or flying in formation. With a wingspan of 7 feet and an odd-looking pouch under its bill, this bird is unmistakable though the smallest in the pelican family. Every morning, these birds must stretch their pouches to keep the skin flexible and tear resistant. 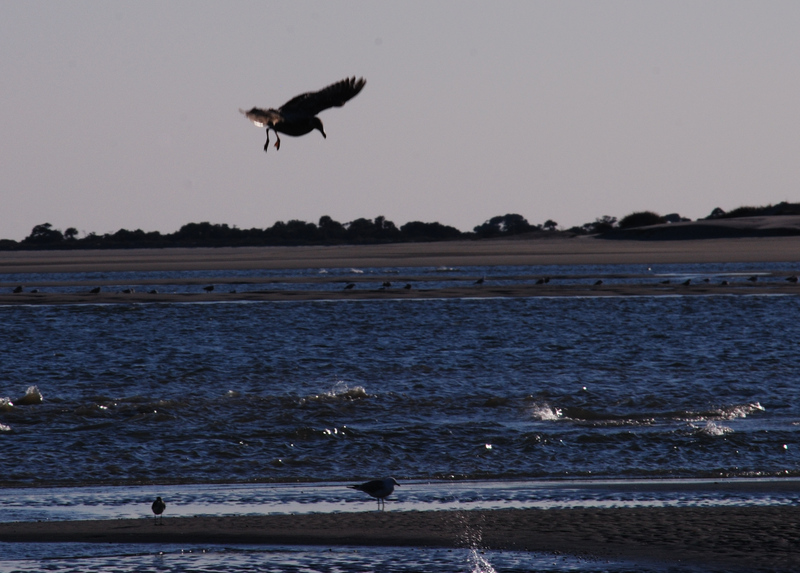 A tricky bird spotted flying around the beach looks similar to a seagull, but dives in the water pelican-style. Terns are numerous along the coast and can range from mockingbird-sized to seagull-sized. They are mostly white with a black head and very long, skinny wings. Though there are several dangerous jellies in the waters off South Carolina, the most common that washes up is the Cannonball Jelly. This harmless creature is planktonic, meaning it does not have much control over where it goes, but it does dive deeper during the night and come back to the surface during the day. These jellyfish have a brown border on their bell and if you look closely, you can see the tiny ‘eye’ spots that detect light, direction, and scent molecules. Their feeding organ is on the underside and they use it for catching plankton. Many jellyfish serve as food for sea turtles. There are many crabs that live at the beach, but the one most likely hiding under your beach towel is the terrestrial Ghost Crab. These odd fellows spend their life running from the upper beach and sand dunes to the swash zone [where the sand is just wet] and back again. During the night they come out to feed on clams and spend the day in their burrows. Though they can breathe air, they must have wet gills to do so, that being the only reason they would enter the water. Their holes are usually in dry sand, about an inch or so wide, and during the hotter days, are plugged up with loose sand. 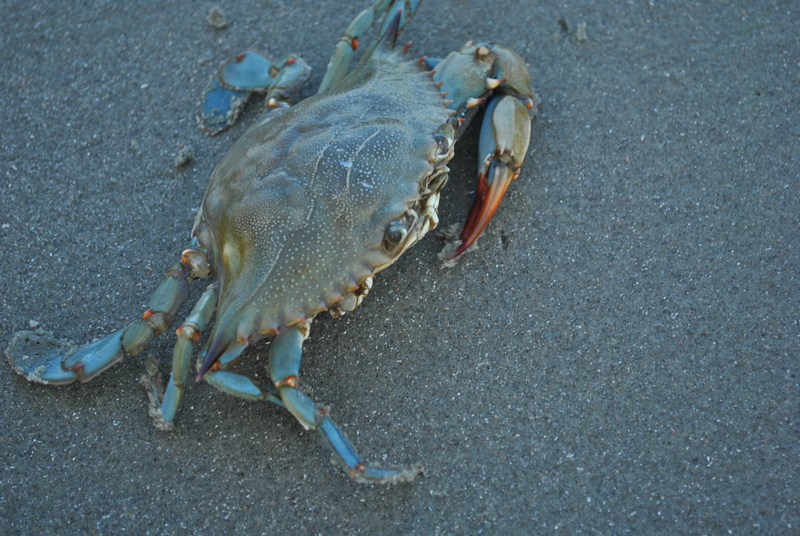 There are many types of swimming crabs that often wash up on the beach. 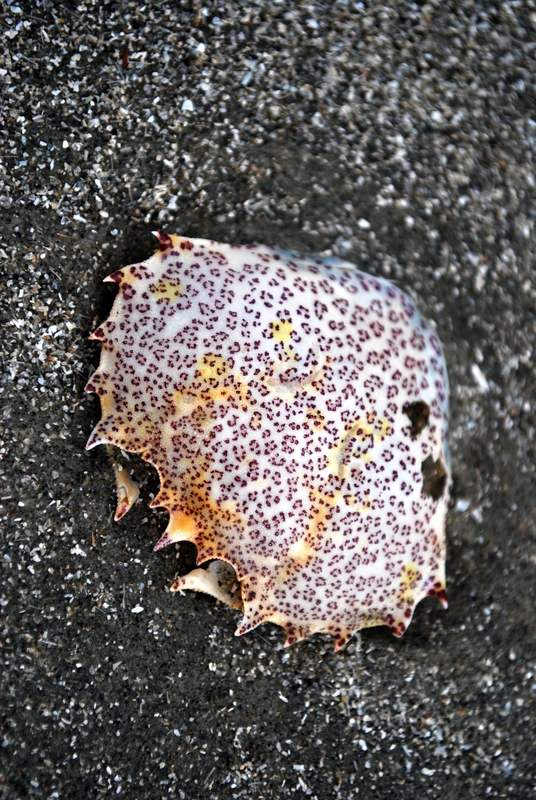 Most common is the Speckled Crab though you can also find Blue Crabs occasionally. These crabs have modified, canoe paddle-looking back legs called swimmerets. 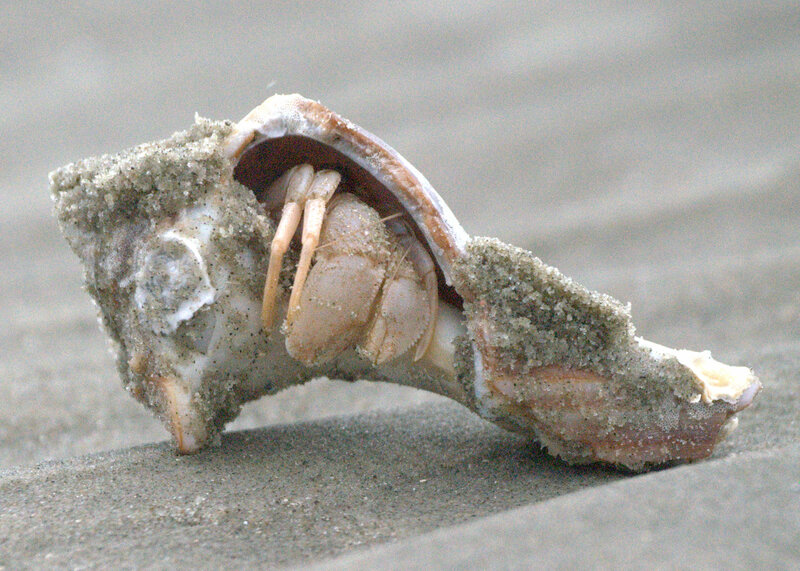 Last but not least of the true crabs, the Hermit Crabs often make appearances near beach towels. Three species, the Long-wristed, Flat-clawed, and Striped, live in shallow water and are often seen scuttling back to the surf as the tide is receding. These little guys are foragers, picking food out of the sand, and they can often be observed fighting with nearby neighbors over shells. They have a abdomens that look more like stingers than crab tails. 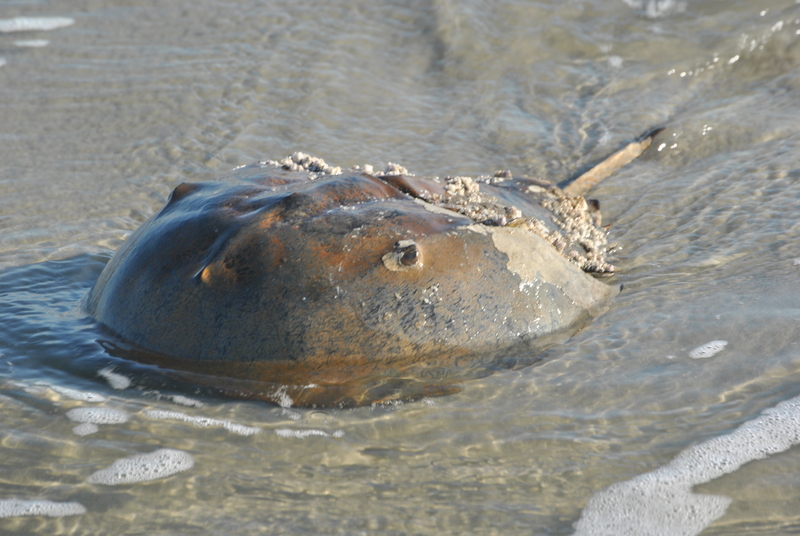 Although not a true crab, the Horseshoe Crab needs mentioning. 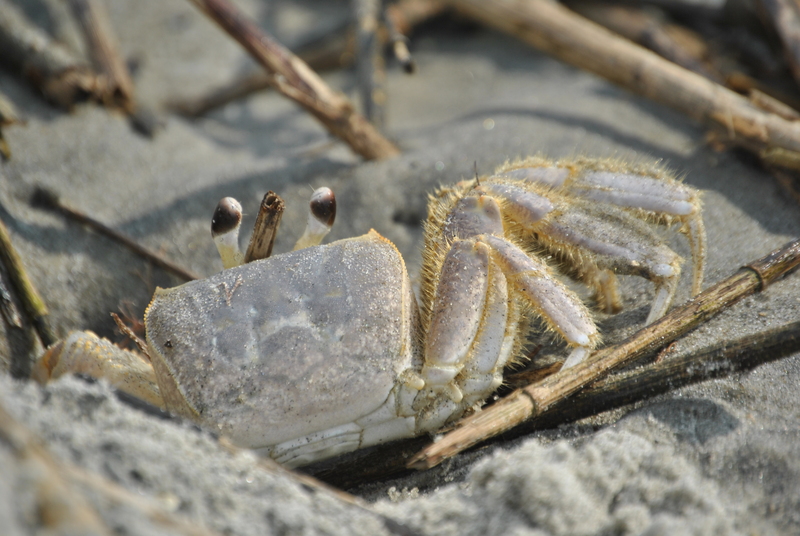 Typically bottom dwellers, these harmless crab-like creatures come ashore to lay eggs. Occasionally their molts [shed exoskeletons] will wash up or be found floating on the surface of the water. The females are typically much larger than the males. Males have a front claw shaped like a boxing glove that helps them hold on to the shell of the female during mating. The Ghost Shrimp is an abundant, crab-like creature whose burrows are often the object of curiosity for many beachgoers. When the burrows are just near the swash zone, they will often bubble and spew while the Shrimp pumps water through its burrow system. The Shrimp make thousands of tiny holes in the sand, generally the only evidence that they are even there. They have one large, white claw used for defence and mantaining the burrow. 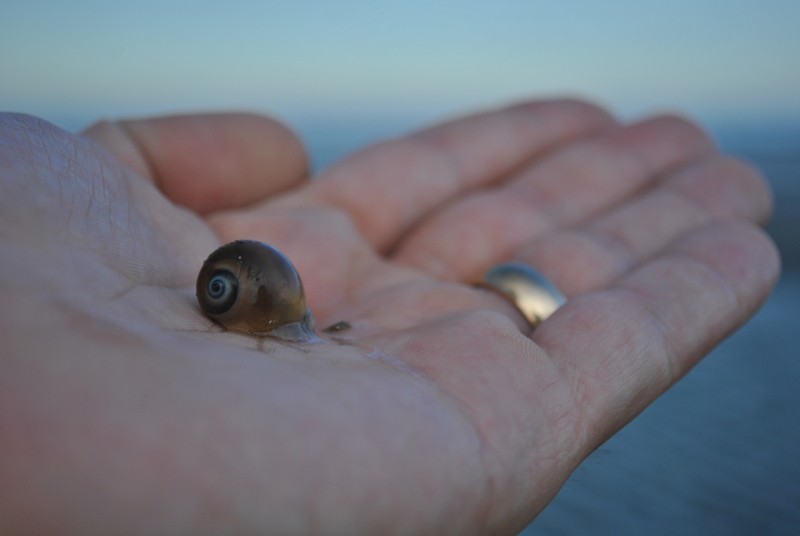 There are many snails found on South Carolina beaches. 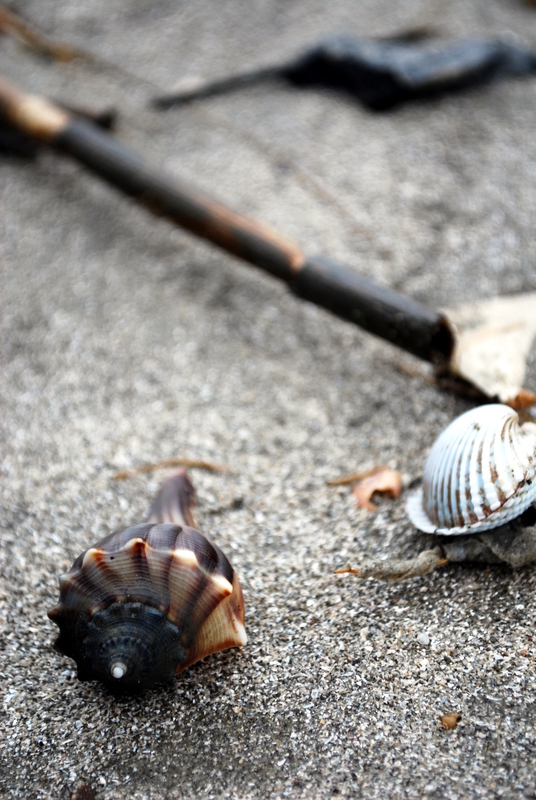 Their shells are collected for their beauty, but little thought is put into what these snails do under the sand. Most of the snail shells you’ll find are from carnivorous creatures that attack and eat other mollusks. A great example is the Moon Snail or Shark’s Eye. Moon Snails are responsible for the little beveled holes you see in other shells, the ones that look like they were put there to make jewelry. The snail creates these by licking the shells with its specially adapted tongue, called a radula. 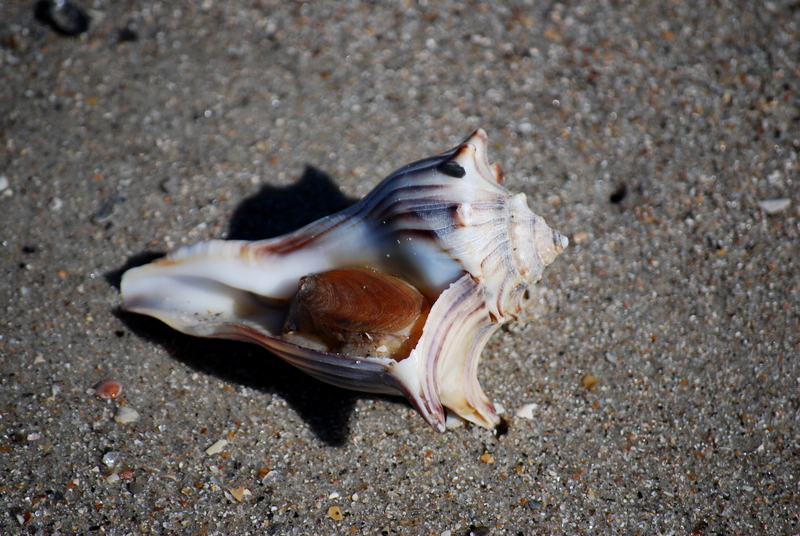 Another predatory snail is the Knobbed Whelk, with its left-handed [opens on the left] counterpart, the Lightning Whelk. These snails pry open bivalves with the sharp edge of their shell. Alright, longest post ever. I’ll start a Part Two as I think of more creatures. Leave a comment if you’d like to see a specific one mentioned! Thanks! First off is the sodium-filled topic of salt pruning. 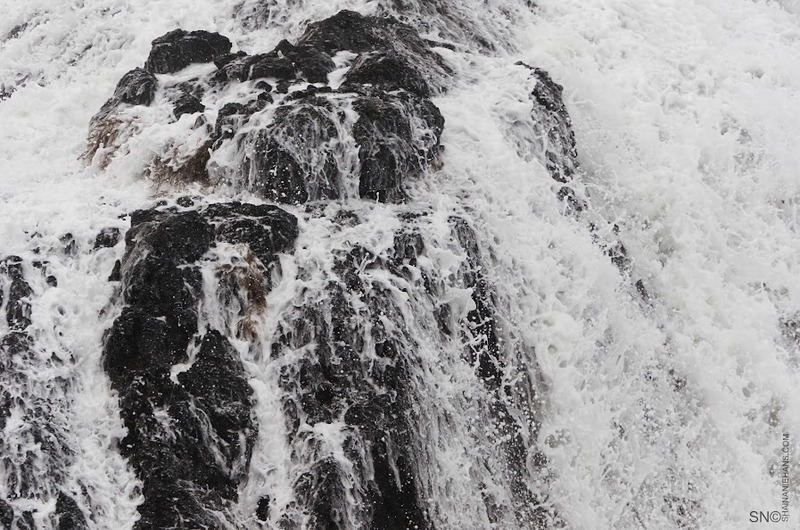 Salt pruning occurs when ocean spray is blown onto the vegetation at the ocean side of the backbeach area. The constant inundation of saline mist stungs the growth of the plants and makes them look like they’ve been pruned into wedge shapes, with the shorter side towards the ocean. The photo above was taken from behind the wedges and the ocean isbehind the vegetation row. 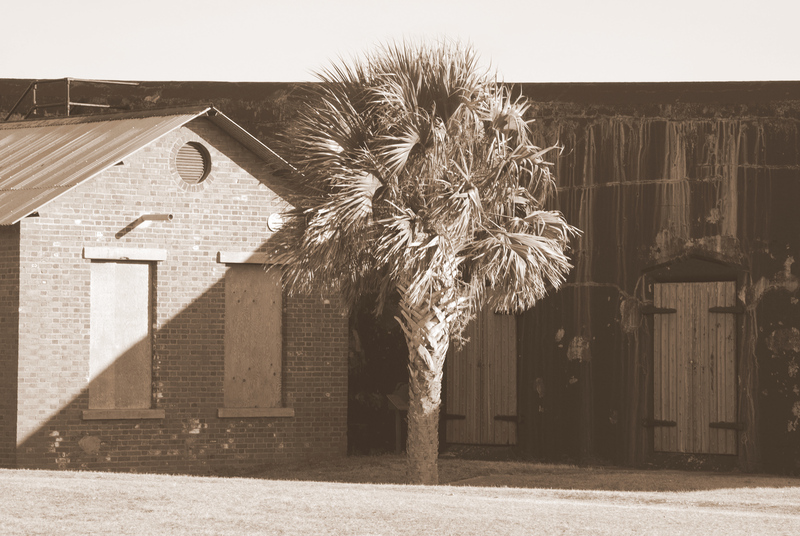 The above picture, and the one below, were taken at Fort Moultrie. On to the gulls. 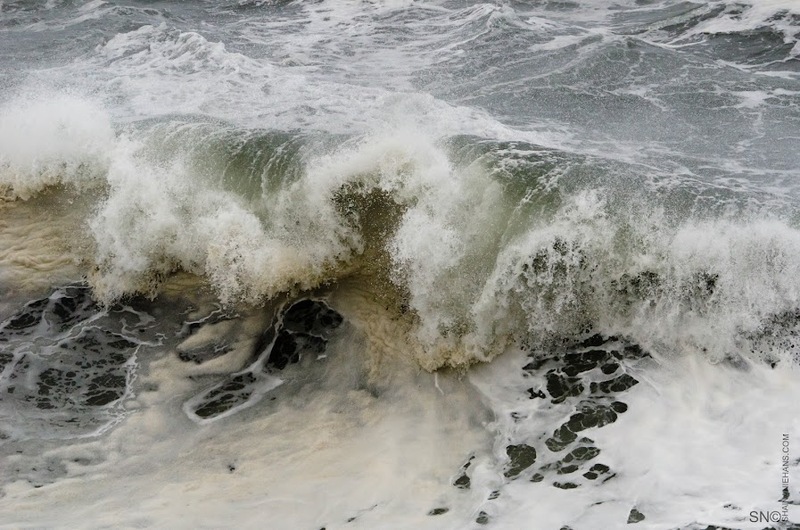 Although this behaviour is well-documented and nothing new to those who live on the coast, if you haven’t frequented beaches, you might find this behavior new and maybe a little surprising. 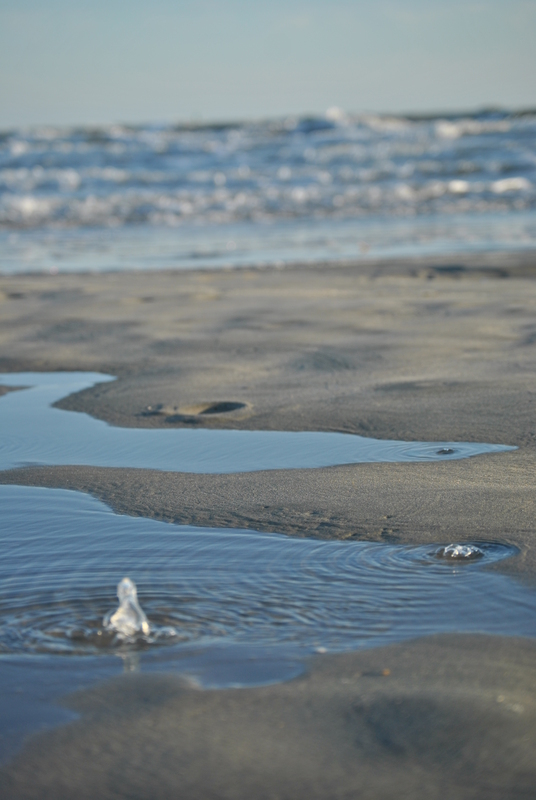 Generally called shell cracking, many species of gulls engage in this behavoir, on both coasts and probably elsewhere around the world. The article, The Developement of Shell-cracking Behavior in Herring Gulls, [PDF] observes that first year gulls don’t have the hang of shell cracking and the technique, such as height the shell is dropped from and the surface on which it’s dropped are eventually learned and perfected so that the birds don’t have to make as many drops. 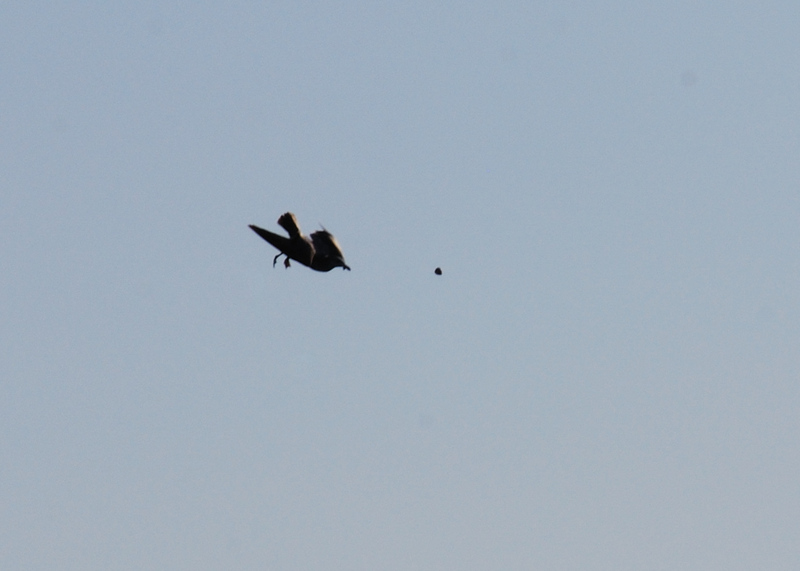 While watching the birds yesterday on the south end of Folly Beach, we saw some that just sat on the ground and dropped the shell from that height a couple times, and others that flew several dozens of feet into the air to drop their snacks. 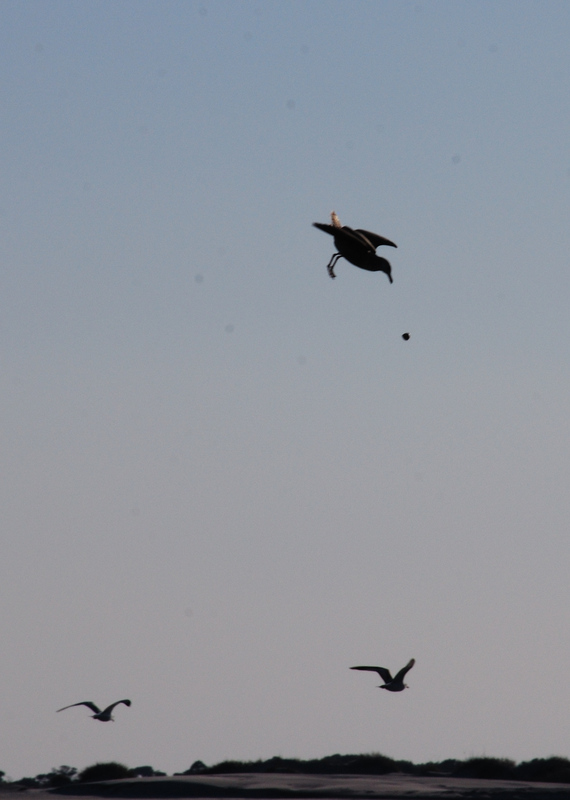 The only problem with going so high and dropping seemed to be that other gulls had a better chance at getting a free meal. Maybe that explains the reluctance at times to let the food fall? 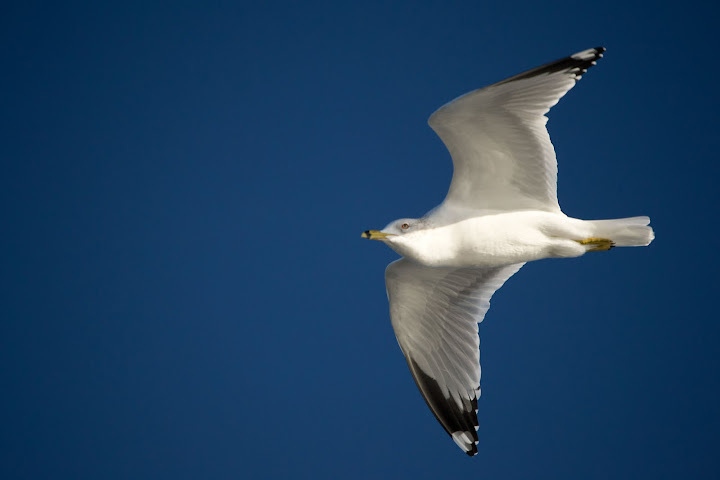 A couple of gulls were seen grabbing their food midair and re-releasing, sometimes repeating the process a couple times in one flight. 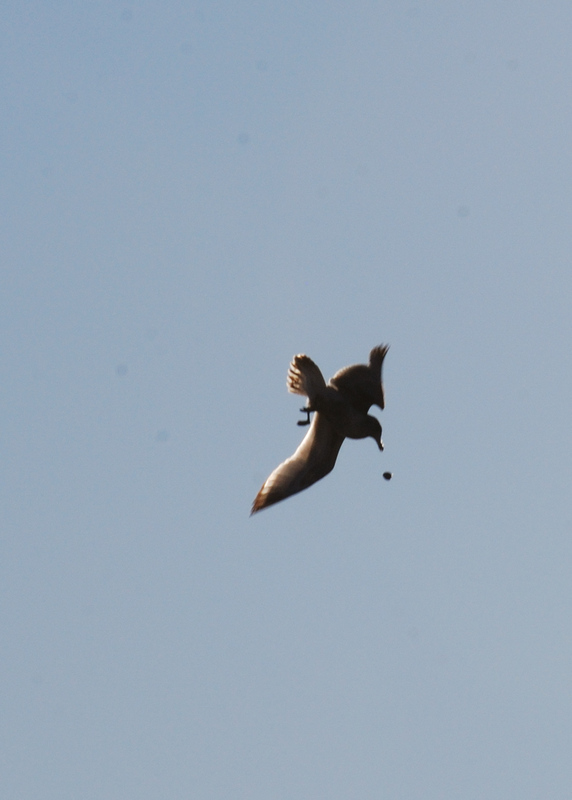 One herring gull, perhaps angry at a ‘flock-member’ dropped a shell right on the other gull’s back! The gull’s food hit the water. Wonder if that’s a harder surface than sand?